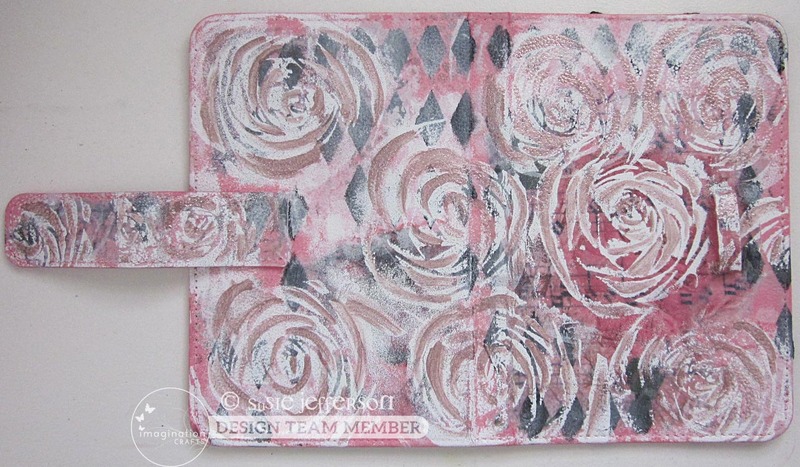 This is another tablet cover, perfect for an iPad Mini or the Samsung Galaxy S2 - I've used Imagination Crafts Shadow Rose stamp throughout. 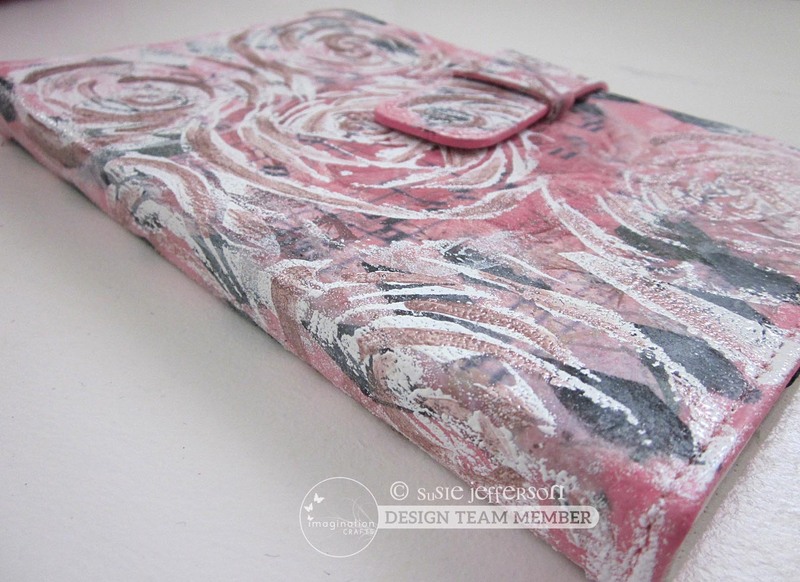 The actual tablet is faux leather, so very easy to stamp onto etc. 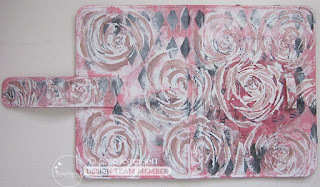 The background images are roses from the rice paper sheet, and the black diamond shapes are stencilled on with black gesso. 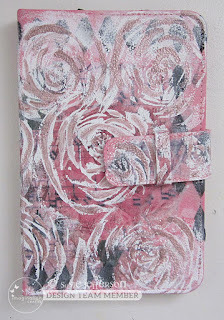 This looked too heavy, so I went over with white Brilliance ink, once dry. 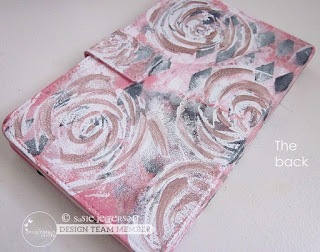 I stamped and embossed the Shadow Rose all over to create a pattern, using white Brillance ink and white embossing powder. You need to take a little care not to have your heat gun too close to the cover in case you melt the faux leather. 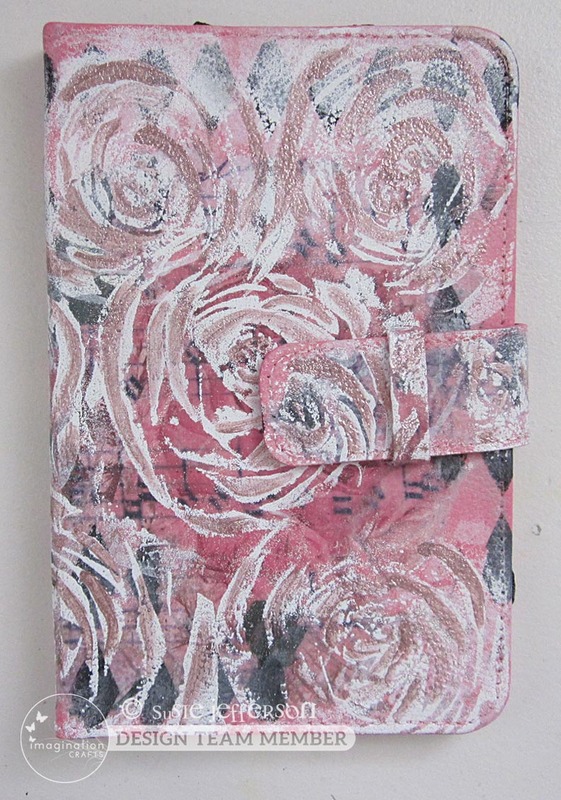 I also used a fine paintbrush and Starlights paint in Antique Pink, and just painted in the swirls for more drama and a lovely shine. Inside, I stamped again - this time I used pink Brilliance ink - which is permanent when dry. Ranger Archival is also a good ink to use. 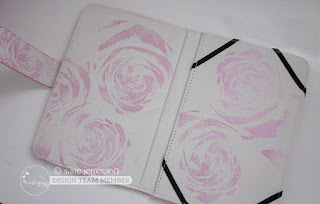 NOTE: I never ever use StazOn with transparent stamps, as one is photopolymer and the other is solvent based, so you lose a tiny bit of detail every time the ink touches the stamp. The outside, with the cover laid flat. You can just see the rice paper roses under the stamping. Et voila! a very nifty tablet holder that doesn't look like everyone else's!